INKin' All Night! 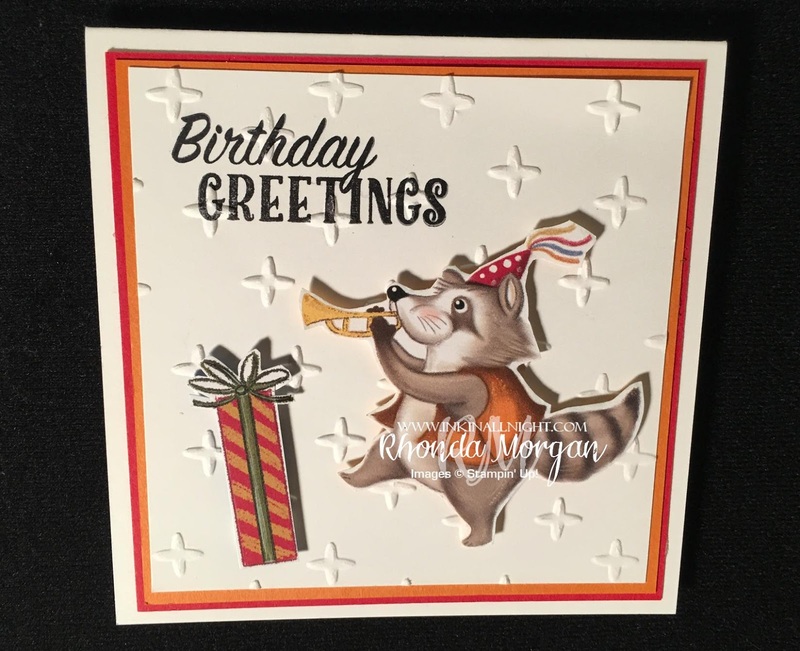 : Party Animal, Birthday Greetings! Today will be a quick post as I'm playing catch up so you don't miss out on what I had intended to share with you this week! Today's cute little guy was a favorite of mine! A little fussy cutting the old fashioned way since there isn't a coordinating stamp/framelit for this party animal image & the present was super easy to trim out. It doesn't show well in this picture but on all of the little cross marks in the background (Sparkle TIEF) I have used the Wink of Stella glitter pen on them! Super cute and easy, just stamp your greeting before you emboss the layer! I made this a square card instead of the standard size. You can still mail in a standard envelope to save on postage! He just makes me happy, hope you like it too! Labels: Birthday Delivery Bundle, Birthday Memories DSP, Birthday Memories Suite, Sparkle TIEF, Stampin' Up!